I'm framing up some preparatory ink and wash sketches that I like. I ordered several frames, square, off-white in which I'll float-mount frame about 8 drawings. 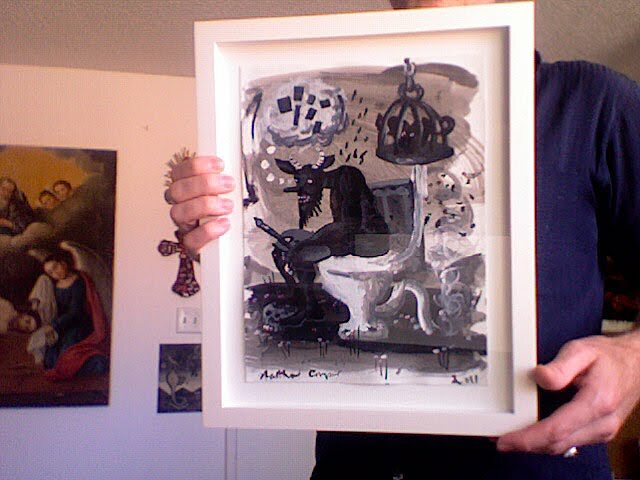 This is number two drawing, literally, of a devil on a toilet. I've just recently posted a photo of a ceramic talavera version of this motif that is on show at Rayner Brothers Gallery at present. I'm also working on my hand-modelling angles and techniques. I'm framing up some preparatory ink and wash sketches that I like. I ordered several frames, square, off-white in which I'll float-mount frame about 8 drawings. 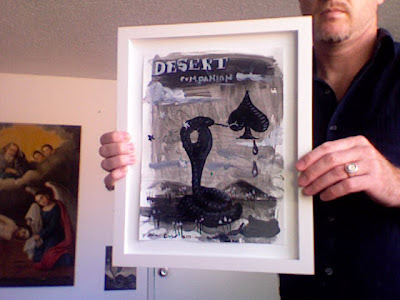 This one in the photo I haven't actually made a painting of yet, but it's based on my planchette snake idea (based on an Indian cobra, but with a hole in the middle of it, similar to that of a planchette which is the little wooden device used on Ouija boards). Apparently it's snake season here in Las Vegas, but not knowing anything about herpetology, I wouldn't have a clue what type of snakes are out there. Anyway, this is called 'Desert Companion', which is also the name of the local lifestyle magazine.